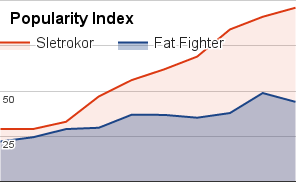 Fat Fighter Review (UPDATED 2019): Don't Buy Before You Read This! Fat Fighter is a weight loss diet pill made with fiber and enzymes for appetite suppression and waste elimination. It’s made to help support the health of the intestinal tract. There are 8 bulking fibers that are said to suppress appetite and detoxify the body. The digestive enzymes are added to improve digestion and metabolism, and added minerals are intended to metabolize macronutrients, support lean muscle growth and regulate blood sugar. This Fat Fighter review will go over the quality of ingredients, possible side effects, customer reviews, and much more. The list featured here has the top 10 ranked diet pill supplements. Gas, stomach cramping, and digestive issues. Nausea, allergic reactions, and choking. Chest pain, vomiting, and difficulty swallowing and breathing. It’s often advised to drink at least 8 ounces of water with it to prevent any choking or blockages. Therefore, it’s important to be aware of any potential interactions to those who already have possible issues. Much like other ingredients added to Fat Fighter, it’s important to drink enough water to prevent potential side effects. Gas, stomach discomfort, and frequent bowel movements. Glucomannan: Thickener taken from the konjac plant which is used to treat constipation and to help absorb water to create a bulkier stool. It’s also used to help regulate blood sugar and cholesterol. Blockages in the throat, intestines, and difficulty breathing. Vomiting, indigestion, and loss of appetite. There have been many documented cases of people choking from extracts of this ingredient. Typically, it’s recommended to drink 8 ounces of water with each serving. Patients were given a total of 3.99 grams of glucomannan a day. This is much more than the 75 mg provided per serving in Fat Fighter. It needs to be tested and shown to be free of any mycrocystins that can cause serious side effects. It’s also only advised to be used by people who have strong immune systems. It can potentially lead to severe illness in certain people. Studies into this ingredient have shown that it can be contaminated with lead, arsenic, and mercury. Even in small amounts these heavy metals can cause severe symptoms even in healthy people. It’s unknown where Fat Fighter sources their Spirulina from, and whether or not they test it for potential toxins. Diarrhea, stomach pain and discomfort. Allergic reactions, swelling, and rashes. Nausea, rashes and abdominal pain. Irritability, sensitivitytolight and liver toxicity. ConsumerLab.com also ran a study showing that many supplements using this ingredient will often either add much more or much less than what’s claimed. Our experts rated the best diet pills inside a top 10 list found here. There are all natural ingredients like cascara sagrada and aloe vera which are healthy and effective. Though there are also additives like Coenzyme Q10 which have not been proven to be effective. Other ingredients which may be potentially unsafe include Spirulina, glucomannan, psyllium seed husks, and bromelain. All of these have shown the possibility for causing many unwanted symptoms. A lot of the fiber sources in this require lots of water in order to prevent the possibility for choking. 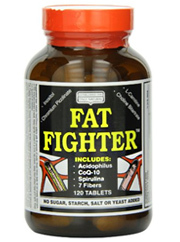 The makers of Fat Fighter fail to list the potential for choking and difficulty swallowing. This is important as many of these ingredients on their own have a possibility for causing blockages in the throat and intestines. Some of these additives are not advised for people with weakened immune systems as well. Ingredients like Spirulina for example need to be sourced from safe waters. It has shown the potential for being contaminated with heavy metals. There’s no information provided by the makers of Fat Fighter to help show whether or not they test their ingredients for contaminants. The top 10 list featured here has the top ranking diet pill supplements out now. Direct sales are offered at 120 tablets for $23.99. Since a maximum of 9 capsules a day is recommended, the daily price would be $1.79. Each bottle provides roughly a 13 day serving. This is a considerable amount of pills one has to take. This is common however in diet pills that contain large amounts of fiber ingredients. Most of the ingredients in this are often used as a way to promote laxative effects, not to promote sustained weight loss. The ingredients offered are mostly cheap to source as well. There’s also the important unanswered question of where the company sourced their ingredients. Both Coenzyme Q10 and Spirulina have shown the possibility for being potentially added in unsafe amounts. A top 10 list of the best diet pills is available when you click here. There’s no mention of whether or not they allow for a money back return. Very little information exists about how they operate outside of their own website. It’s also unknown of how well they study their ingredients. As mentioned before, Fat Fighter has additives which must be carefully selected in order to prevent any possible serious side effects. The list provided here has the top 10 highest ranked diet pills. Many people felt there were no weight loss benefits. People complained it failed to improve metabolism, suppress appetite, or have any noticeable benefit. People were also concerned that the pills were much too large. Since it’s advised up to a maximum of 9 pills, it requires a lot of supplementation for it to produce effects. A list of the best diet pills are found when you click on the link featured here. How Does Fat Fighter Compare? Conclusion – Does Fat Fighter Work? Fat Fighter does come with natural ingredients, and some of them are effective such as cascara sagrada and aloe vera. There are issues with the other ingredients which have been shown to not only be ineffective for weight loss, but potentially harmful. Additives like glucomannan, Spirulina and others have shown the possibility for serious issues including choking and organ damage. Also, one has to take upwards of a total of 9 pills a day. Customers also often agreed there was no weight loss benefit. The 2019 diet pill of the year was won by Sletrokor. This all natural formula is made up of plant extracts that have been clinically studied. It’s made to help suppress appetite, improve mood, enhance metabolism, burn calories, and it can promotion many other benefits. Customers have left testimonials on their official website showing effective weight loss results. You can try Sletrokor risk free for a total of 30 days. Returns are allowed for any reason and with no questions asked. 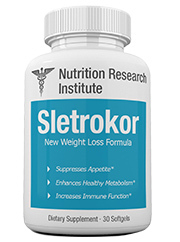 To learn more about Sletrokor, click this link. Thank you for the post.I don not like Fat Fighter their method of website is fake. My friend had an awful effect to this cheap Fat Fighter with upset stomach and had a problem getting a refund!Don’t try this product unless your medical adviser prescribe it! Ive been using it for thirty weeks and working out every other day at home, eating low calorie meals, running at gym, doing pilates. I kept gaining, gained 29 kg. in 7 weeks beliving to new scales. My start weigh was one hundred fourteen lb and now i am one hundred fifty six pounds!